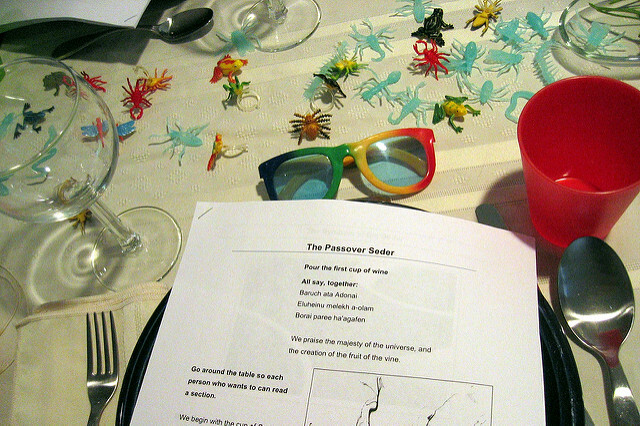 A DIY Haggadah adds a personal touch to your seder and can make for a more meaningful holiday. Making your own Haggadah is not just a money-saver, but also a great way to educate yourself about the Passover seder, add a unique twist to your seder and have a more meaningful and satisfying holiday. For generations, enterprising seder leaders have been sticking post-it notes in their favorite parts of existing Haggadahs, adding in photocopied readings or even cutting and pasting from multiple Haggadahs and combining it all in a looseleaf binder. The Internet makes the project of creating a personalized Haggadah infinitely easier — and tidier, even if your tech and graphic design skills are minimal. Plus, you can do it with a clean conscience: Whereas the old-fashioned technique of photocopying pages from copyrighted, published Haggadahs is technically illegal, the websites we list below provide only material that is in the public domain. While a seemingly infinite trove of Passover-related blessings, readings, songs and images are available online, don’t forget that you can also incorporate your own (or your guests’) writing, art and family photographs into the finished product. Many DIY Haggadot are copied and stapled, but you can make yours more durable (and spilled wine resistant) by laminating each pages or putting them in a photo album, looseleaf binder with plastic sleeves or art portfolio like this. Or, if you are reasonably tech-savvy and want to go paperless — and your guests are OK with using electronics on Passover (when traditional prohibitions similar to the Shabbat rules apply) — keep the whole text digital. You can email a PDF, PowerPoint or other document to your guests to download on their mobile devices, or even create a password-protected website. Haggadot.com is the most comprehensive and user-friendly resource for Haggadah makers — and it’s free. After you register, you can choose from a constantly growing library of readings and images. The site guides you through the process with templates and an outline of all the sections of the seder. You can search by section, theme (i.e. social justice) and media type (text, video, image). In addition to letting you search by themes, the site also provides templates like this with recommendations for family-friendly and other specific needs. Sefaria, a growing online library with many major Jewish texts in Hebrew and English, offers everything from full Haggadahs to supplemental readings to additional commentary. Not only can you print these texts out or cut and paste them into your Haggadah, but you can also embed them into another website or digital document. Each selection is hyperlinked to the full text from which it was excerpted. Looking for something a little simpler? You can download the Haggadah text in English as a Microsoft Word document at LivelySeders.com and add to it (or cut) as you see fit.